Organizers are calling this week’s Super Bowl XLVIII the “First Mass Transit Superbowl.” That’s fair; no other Super Bowl has gone so far in promoting mass transit for fans getting to the game. But transit access is the norm for NFL games these days. The first Super Bowl to be played within walking distance of rail transit was IV in New Orleans, and 10 years ago Houston opened its first light rail line just in time for the Super Bowl. We tend to think of baseball as a downtown sport and football as a suburban one. That’s true to some extent; there are quite a few cities (San Diego, San Francisco, ) where the baseball team plays downtown and the football team is in the suburbs, surrounded by big parking lots. But there are actually more cities where both baseball and football are downtown, and even one (Atlanta, always the oddball) where baseball is in a suburban setting (and moving to a more suburban one) and football is downtown. Moreover, many of the cities where football is in the suburbs still have rail there. The final score: 72% of NFL teams play within walking distance of rail, nearly as many as the 77% of MLB teams that do. As with baseball, the biggest factor in that increase has been the opening of new rail lines, not teams moving to rail. That includes three teams — the Patriots, the Jets, and the Giants — that have gameday-only commuter rail lines to their stadiums. The most visible difference from baseball on this graphic: football teams move more often. But the last time a team moved from a stadium with rail to another city that didn’t have rail (or rail in the works) to the stadium was the Raiders in 1982 — and they moved back to their old stadium in their old city a little more than a decade later. In the past two decades, the United States has seen a boom in ballpark construction. Two thirds of the current Major League Baseball venues were opened in the last 20 years. The expectations of what a ballpark looks like have completely changed. And so, it seems, have the expectations on how to get there. In 1970, 38% of baseball parks had rail transit access; by 2016 it will be 77%. Part of this change has been driven by baseball returning downtown. In San Francisco, for example, the Giants replaced a suburban stadium surrounded by parking lots with a downtown ballpark next to existing commuter rail and light rail lines. But they real change in rail to baseball has been the opening of new rail lines. That was happening as early as the 1970s in Oakland and Philadelphia, but it really picked up pace in the 1990s. In St. Louis, Minneapolis, Houston, Seattle, and Arizona, the city’s first rail line included a stop near the ballpark. Some of this is coincidence: the national trend has been towards downtown ballparks and rail systems invariably connect to downtown to serve its employment base. It’s also an index of just how common rail transit has become: once Cincinnati’s streetcar opens, the only city that has major league baseball but no rail transit will be Milwaukee. But baseball is often featured in the discussion around planning new lines. It is one of the destinations that politicians and transit planners focus on. Does it make sense to build transit to baseball? Logistically, sports venues are the worst kind of transit destination: most of the time, there are no riders, and every once in while, there are very many. A major employment center, a college, or a hospital will do much more to drive ridership. However, sports tends to add riders on weekends and evenings, when stations have capacity and spare trains are available. More significantly, perhaps, serving a ballpark draws occasional riders to the system. If they have a good experience, they might ride more often or, equally significantly, vote “yes” in the next transit referendum. A rail line built to serve only sports is hard to justify as a use of public dollars (just as stadiums themselves can be hard to justify), but if a stadium is on the way to other destinations it will make a rail line more successful. Regardless of merit, the connection between baseball and rail seems to be well established. The Atlanta Braves’ future move to the suburbs is an anomaly, just as their current ballpark, close to downtown but surrounded by parking lots and a long way from rail, is. The last team to move their home away from rail was the Phillies in 1971, and an extension to their new stadium was already in the works. One of the arguments often made for rail over bus is that rail gives passengers a feeling of certainty: those two strips of steel are a promise that a train will be along soon, going exactly where you think it will go. Do the 24 light rail systems in the United States actually fulfill that promise? They offer dramatically different levels of service. At 7:30 am on a weekday, some lines operate every 30 minutes, and some every 5. That difference is huge for a passenger: at a 5 minute frequency, the average wait for a train is only 2 1/2 minutes, and waiting will be an insignificant part of your trip; at a 30 minute frequency, your day can be ruined if you miss a train. In the transit industry, 15 minutes is generally considered “frequent”: at that level of service you can just show up to a station without consulting a schedule. Remarkably, there are three light rail segments in the United States that don’t meet that level of service even during weekday rush hour. On a Sunday morning at 7:30, more than two thirds of the systems have segments that aren’t frequent, and three systems don’t offer service at all. 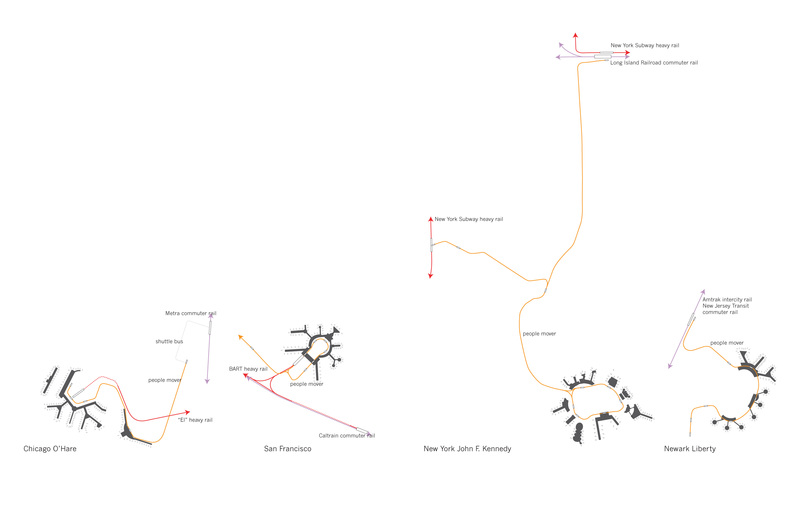 There’s a clear pattern among the systems below, ordered by how many passengers they carry per mile of line. The most successful systems, at the top, have the highest frequencies. That’s actually a reflection of two things. The first is that as ridership goes up, higher frequency is needed to carry the loads. Every system has a limit on train length; if a system can accommodate only 3 car trains, and a three car train every 15 minutes is crammed full, the way to fit more people is to run three cars trains every 10 minutes. The second is that more frequent services are more convenient and will therefore draw more passengers. Thus, increasing frequency will actually increase total ridership. The contrast between frequencies, especially Sunday morning frequencies, often reflects the type of destinations a systems serves. These maps are all to the same scale, and the geographic scope of these systems varies widely. Many of the newer systems, such as Denver, Salt Lake, Sacramento, and Dallas, are designed to connect suburban park-and-ride lots to jobs in the urban core. These systems tend to carry mainly home to work trips for office workers, so ridership on these systems tends to peak heavily at rush hour. Low off-peak demand leads to lower off-peak frequencies. Older systems in Boston and San Francisco, as well as new systems in Houston, Buffalo, and Jersey City, stay within the urban core, connecting walkable neighborhoods to a variety of destinations, including universities, hospitals, shopping, and entertainment. These systems attract riders all day, every day, increasing overall ridership and justifying more offpeak frequency. The vast variation between these systems comes despite the fact that all of use the same technology, and some even the same exact trains. When we speak of transit only in terms of mode (heavy rail, light rail, streetcar, BRT, bus) and not level of service or destinations served, we’re missing the most import aspects of what makes transit useful. This site is an atlas of fixed guideway transit. It includes profiles of each metropolitan area in the United States, each illustrated with a map to a common scale. It also includes articles on topics like destinations, technology, and service, many of which are repurposed from my old blog, Intermodality (www.ctchouston.org/intermodality). You’ll find all of these in the menus at the top. All of this is a work in progress; I’ll keep adding as time allows. 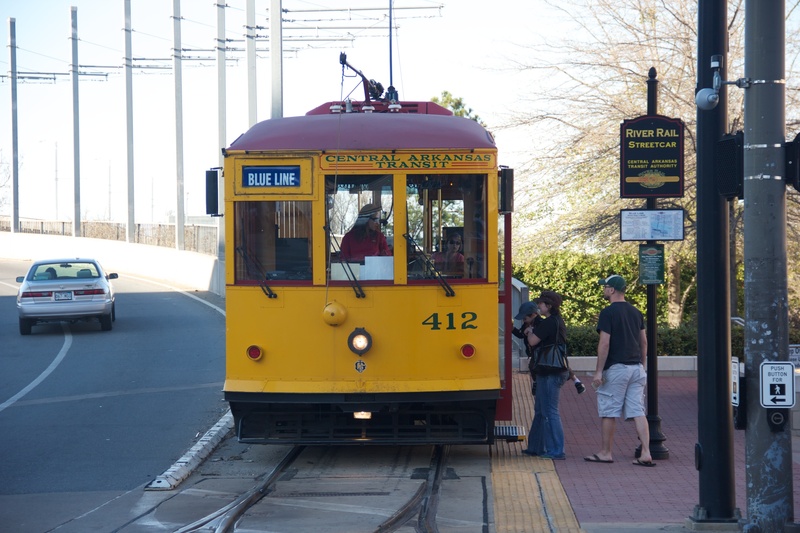 Streetcar Systems: which ones are good transit? When a city plans a rail new transit system, it is almost inevitable that a connection to the airport is included. That’s a reflection of the importance of plane travel, which has become ever cheaper and more widely used. But it’s also a product of transit politics. 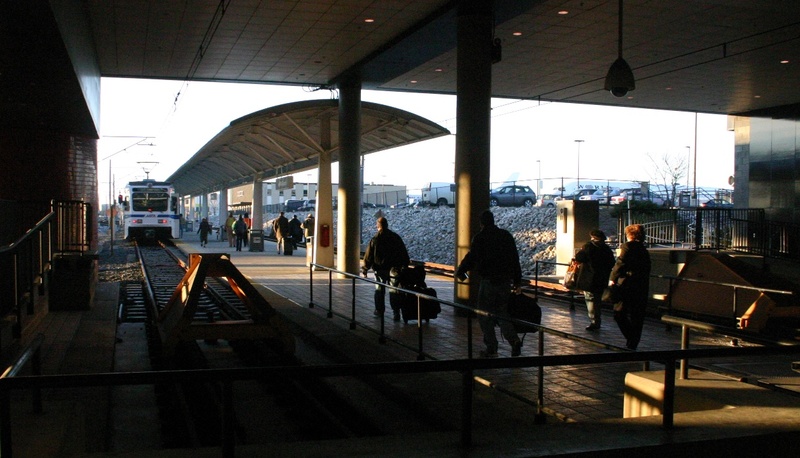 Many rail planners have discovered that the numbers don’t seem to justify such a connection; employment centers generate many more riders, and bringing a rail line into an airport is often complicated and expensive. But the public sold on airport connections; someone who takes the train to the airport every few months has as many votes as someone who rides to work every day. The first rail connection to a U.S. airport was Cleveland in 1968. That station was directly inside the airport, setting a pattern for systems to follow. This remains the “holy grail” of airport rail connections. Probably the best example of the type is at Atlanta’s Hartsfield Airport, where the station was built as part of the terminal, an escalator ride away from baggage claim and closer to the ticket counters than the parking garage. Elsewhere, stations were included in the basements of parking garages (Chicago O’Hare), slipped in alongside drop-off lanes (Philadelphia) or tunneled below the airport (Minneapolis). Unlike Atlanta, many airports have multiple terminals. This design tailors to cars, distributing traffic and putting the drop-off lanes closer to the gates. But it’s hard for accommodating transit. Philadelphia solved the problem by putting a station at each terminal; a train to the airport stops at each one in turn. That’s even harder to engineer, though, than a station inside one terminal, especially at airports that have grown haphazardly. A more common solution is to use an automated people mover to link to terminals to a single transit station. Many airports are adding such people movers to connect terminals to each other (important in an era of airline alliances, where many passengers transfer from one terminal to another) and to parking lots and rental car centers. Once such a system exists, it’s not hard to extend it to a rail transfer station. People movers, with small vehicles suited to steep grades and tight curves, are easier to fit into an existing airport. Even more importantly, they make it easy to link existing rail lines to the airport, as has been done at New York’s airports. Nothing is less expensive, though, than operating a shuttle bus to the airport from a nearby rail station. This is by far the most common air-rail connection. The shuttles usually run frequently, directly from the station to the terminals, and they are indicated on rail maps and timetables. In some cases, a shuttle bus is a temporary measure until a rail extension or people mover is built, but other airports – like Boston – have used such connections for years. Even the most convenient rail connections, though, serve only a portion of airport passengers. 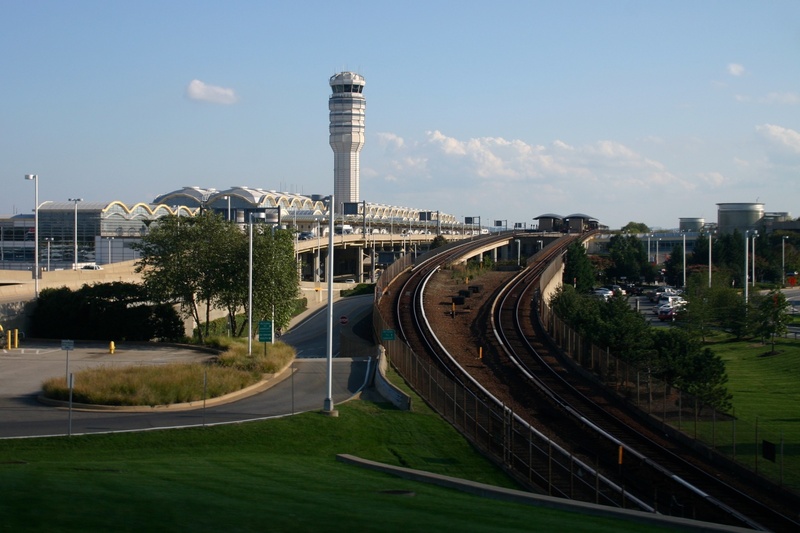 Even at National Airport, with a convenient connection to one of the most comprehensive rail systems in the country, only 15% of passengers ride rail. In Atlanta and Chicago, that figure is under 10%. There are many reasons for this: passengers with a lot of baggage will not be willing to walk to stations or negotiate elevators and crowded train cars, downtown-centered rail systems will cause trips from other suburban locations to the airport to be much slower than cars, and travelers arriving in an unknown city are more likely to be comfortable with hailing a cab than using a rail system they do not know, regardless of how comfortable it is. But airports are employment centers as well, and airport employees may be more likely to use transit than passengers are. International travelers know that U.S. airport connections are somewhat lacking by international standards. In London and Hong Kong, non-stop trains connect downtown terminals with airline check-in counters directly to the airport; in Paris and Frankfurt airport rail stations serve not only local transit but high-speed and conventional long-distance trains to all parts of Europe. But such connections are coming to the U.S., too. The Newark airport rail station is the first direct rail-airport connection on Amtrak’s busiest rail route. Continental Airlines had now added Amtrak to its list of airline partners; air passengers can now book a “flight” segment from Newark to Stamford, Connecticut which never leaves the ground. Washington Reagan National Airport’ convenient rail connection (top) resulted not from building a station next to the terminal but from building the new terminal, opened in 1997, next to the station, built in 1977 under the airport’s master plan. Trains run every 3 minutes, and it’s only a 12-minute ride to Downtown. Baltimore-Washington International (bottom) is served by an at-grade light to a stub-end station at one end of the terminal. A separate shuttle bus connection leads to an Amtrak and commuter rail station. People movers are not as convenient as a station in the terminals. But sometimes that convenience is illusory. 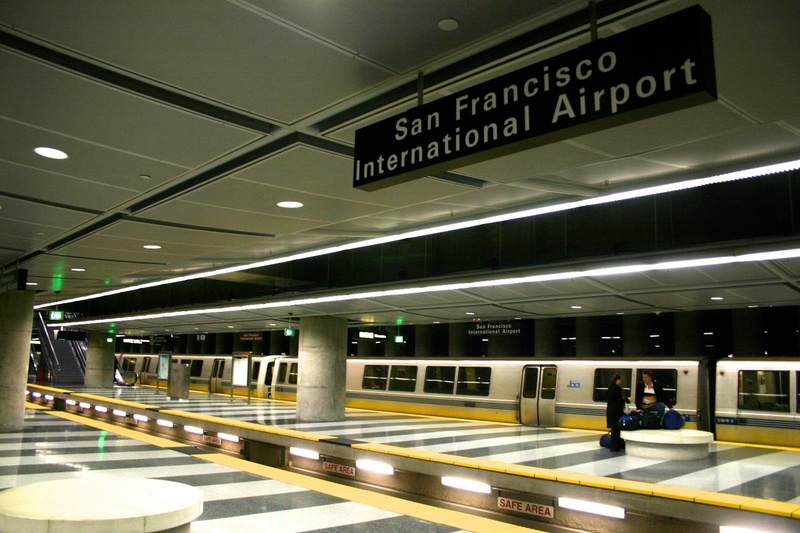 San Francisco went to great expense to fulfill politician’s promises to put BART inside the airport. The line branches in two; one route extends to a the airport while another connects to a commuter rail (Caltrain) transfer station just outside the airport. But the station is inside the international terminal only; the domestic terminals are a long walk — or a short people mover ride — away. Thus, most passengers transfer to the people mover anyway. Meanwhile, Caltrain passengers headed to domestic flights must transfer to BART, then transfer again to the people mover. Bringing all BART trains and the people mover into the commuter rail station would have been no less convenient for most BART passengers, more convenient for commuter rail passengers, and a good deal less expensive. In fact, that’s exactly what Miami will be doing. These diagrams are all to the same scale. In New York City, where Continental Airlines has a hub in Newark while Delta runs shuttle flights from LaGuardia and Jet Blue is based at JFK, airlines compete on ease of access to each airport. When Airtrain Newark (upper left) opened in 2001, Continental began advertising the new, convenient connection to Manhattan in ads, on its website, and in its inflight magazine (lower left). Airtrain Newark is a single monorail line that connects every terminal to a remote parking lot and to a station serving Amtrak intercity trains and New Jersey Transit commuter rail. It’s the most convenient Amtrak to airplane connection in the Northeast. 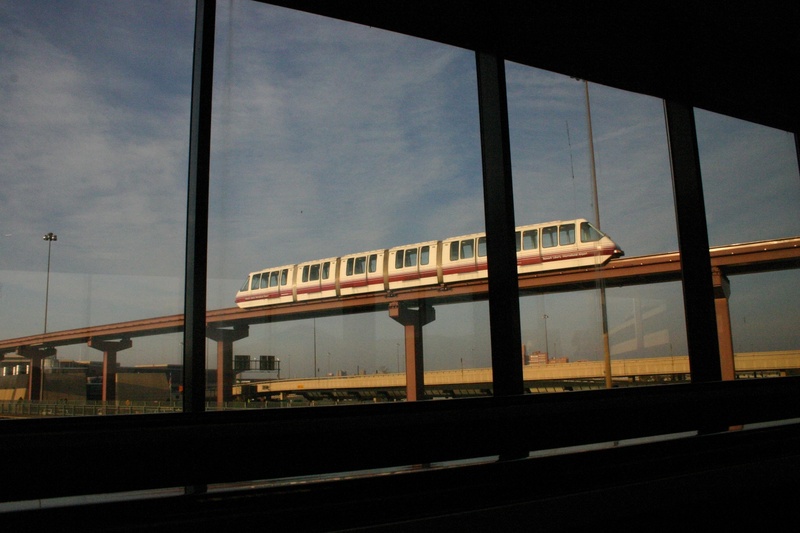 The Airtrain JFK connection, built at the same time as Newark’s, is the most extensive airport to transit people mover ever built. One branch runs three miles from the terminals to the Howard Beach subway station; the other nearly five miles along the Van Wyck Expressway to the connected subway and commuter rail stations at Jamaica. In New York, where the airports are run by a bi-state authority, rail access was a political issue; New York’s approval for Airtrain Newark was contingent on building a similar system at JFK and vice-versa. La Guardia, the smallest of the three metro airports, remains without a rail connection, although before 2001 Delta Airlines offered fast ferry trips to Manhattan. Amtrak’s Acela Express, which stops at the Baltimore-Washington airport rail station, isn’t just a way to get to the plane: it’s a replacement for the plane. Amtrak carries more people between New York and Washington than all the airlines combined, and that market share is increasing as air travel gets more complicated. In Europe, high speed rail lines in France, Germany, Spain, and Britain have replaced short-haul flights, freeing up airport capacity for long-haul flights. San Jose commuter rail Caltrain shuttle bus ???? 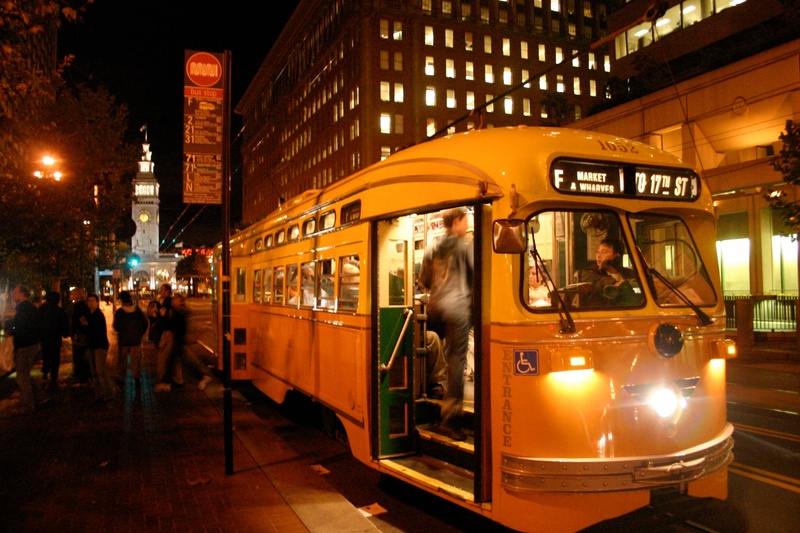 We’re in the midst of a streetcar boom in the United States. In city after city, political leaders are promoting new streetcar lines. But not all streetcars are created equal. The systems that are already operating, under construction, or in design vary dramatically in how effective they are: San Francisco carries over 3,000 passengers for every mile of route, but Little Rock carries only 100. What makes the difference? Destinations and service. The successful systems run frequently all day, connect a variety of destinations, including employment, residential areas, and leisure destinations, and integrate into a larger transit system. The least successful have infrequent service, limited hours, serve mainly leisure destinations, and were planned as standalone lines. Cities tend to fixate on the visible aspects of streetcars (like the question of vintage vehicles vs. modern ones), but what really matters is the same thing that matters for all transit: does the streetcar go where a lot of people want to go when they want to go, and does it get them there conveniently? 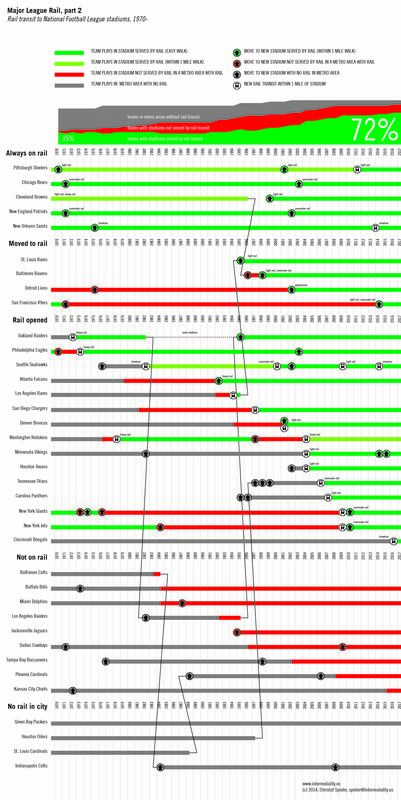 Here’s a comparison of all active US streetcar lines as well as a number of lines under construction or planning. Information is from a variety of sources as of October 2013. Streetcars in San Francisco (top) and Little Rock (bottom): They look a lot alike, but one as 30 times as effective as the other. Why? This is a commuter rail line: San Jose’s Altamont Commuter Express (ACE). It connects nine stations, one of them sort of close to a medium-sized employment center, one with a light rail connection to a suburban employment center, and seven which are basically no more than parking lots. There are six trains a day: three towards San Jose in the morning, three away from San Jose in the afternoon. The last train leaves at 5:35 p.m., and there’s no weekend service. This is also a commuter rail line: Tokyo’s Yamanote Line. It connects 29 stations. All of them are in walkable places, including several major employment centers; all but 2 have connections to other rail transit lines. Trains run every 2.5 minutes at rush hour, and nearly as frequently the rest of the day, from 4:30 am to 1:20 am, seven days a week. Yes, these are both commuter rail lines. But “commuter rail” is a technology, and what matters in transit is not technology but level of service. There is no doubt that a train every 2.5 minutes is different than a train every half hour (or no train at all), that a station that’s within a 5 minute walk from thousands of jobs is different that a station in an open field, that a connection to a reliable transit service that runs every 5 minutes is different than a connection to an occasional shuttle bus that gets stuck in traffic. These two lines are the same basic technology, but entirely different sorts of operations. And the numbers back that up: ACE carries 3,700 trips a day, while the Yamanote Line carries 3,500,000. It’s not technology that really matters, it’s service. And there’s a whole range of service: these are two ends of a spectrum with many other possibilities in between. “We need commuter rail” is an incomplete statement. So is “we need commuter rail to Galveston.” “We need rail transit from Houston to Galveston that runs every 20 minutes all day every day, makes the trip in about an hour, and connects conveniently to UTMB, NASA, Downtown Houston, UH, the Texas Medical Center, and Uptown Houston” is the kind of statement you can design a line around. I already looked at the sorry condition of megaregional transit in Texas. But that could change quickly. At the megaregion conference, politicians – Republicans and Democrats — from Houston, Austin, Fort Worth, and College Station all called for connecting Texas with intercity passenger rail. They also agreed that highway-centric state government needs to pay more attention to rail, and indeed, TxDOT has created a (tiny) rail division. There’s a sense that a political consensus is building for megaregional transit. There are good ideas. But we’re a long way from building anything. As we’ve seen across the United States, local transit strengthens intercity rail. It’s a feeder system, it shares urban alignments and terminal stations, and it builds a transit habit. So all these regional projects can begin to have a megaregional impact. So what kind of system might link these cities? The first option is high speed rail, with a top speed of 150 mph or more. That’s Amtrak’s Acela, Japan’s Shinkansen, France’s TGV, or Germany’s ICE. At this speed, trains need a dedicated, grade-separated line with minimal curves. Where existing freight lines are straight, you could lay new tracks alongside, but most lines are curvy and go right through the middle of small towns. Freeway medians are more promising, but any route is likely to include so new greenfield alignments. 150+ mph also means electric power: diesel can’t handle the speed. All of this adds up to fast and reliable trips (Houston to Dallas in 2:00, Houston to Austin in 1:30) but also to a big price tag. Texas got close to full high speed rail 15 years ago with the “Texas TGV.” The initial proposal called a for a triangle connecting Houston, Dallas, Fort Worth, and San Antonio, with additional stations near Austin, Waco, and College Station. By the time the Texas TGV project died due to opposition from airlines, rural landowners, and small government conservatives, the plan had contracted to a “T,” reducing the miles of track required. That idea is being pushed today by the private (but politically broad-based) Texas High Speed Rail and Transportation Corporation. It’s not as direct as the triangle, but at 200 mph, that doesn’t matter that much. There’s also been another proposal — a constricted triangle — but ultimately the route choice doesn’t change the overall magnitude of the cost or travel times. These proposals resemble California’s high speed rail plan. That will cost $40 billion for 800 miles and carry 247,000 daily trips. Frances’ SNCF recently estimated $13.8 billion for a 350-mile Dallas-San Antonio line (for a 1:50 end-to-end travel time) with 34,000 daily trips. There’s no doubt we can afford high speed rail: Texas spends $5 billion on highways yearly. But it’s not yet clear we have the political will for it. That’s lead some to suggest that we should do what California did 30 years ago: improve regular-speed rail. Conventional passengers trains on tracks shared with freight trains can do 80 mph easily, given straight enough track and/or tilting equipment (like the Talgo trains in use in the Pacific Northwest) they can do 110. That’s not as good as 200, but it comes at a fraction of the capital cost. The first option might to upgrade the existing Amtrak service. We have 0.9 daily trains from Houston to San Antonio; why not 4? We have 2 daily trains from San Antonio to Dallas; why not 6? This plan, however, has about 200 problems: there are a lot of freight trains to dodge on the same tracks. Even with preferential dispatching, passenger trains take 8 hours from San Antonio to Dallas and 5 hours from Houston to San Antonio, and they run over 30 minutes late about 20% of the time. That’s not going to work. We could upgrade those busy freight lines: add double track and build bypasses around some urban areas. But that doesn’t come cheap: a San Antonio-Austin freight bypass is estimated at $2.4 billion. But there may be other options: intercity rail lines that don’t carry a lot of freight traffic or that have been abandoned. Here, we have to pay for upgraded track, but on existing trackbed. That’s cheaper than new double track or new lines. Planning money for one such project – 290 passenger rail — is included in Texas’ request for high speed stimulus funds. Even if those funds aren’t coming to Texas (and I see no cause to be optimistic) TxDOT says they may fund the study with state funds. This would use the Hempstead commuter rail alignment (an existing freight line) from Houston to Hempstead, a Capitol Metro-owned line from Austin to Giddings, and an abandoned rail line from Giddings to Hempstead via Brenham. The Houston to Hempstead line continues to College Station, so that would be an obvious extension, providing Houston to Austin service (the burnt orange line?) and Houston to College Station service (the maroon line?). On the other end, those trains could be extended to Galveston. I’m calling this the Brain Train. Some rough numbers: 2 1/2 hours from Houston to Austin, 1 1/2 hours Houston to College Station, That’s slightly faster than car, and, given airport security times, about as fast as a plane (but much more comfortable.) Cost: maybe $800 million. Ed Emmett – who’s been talking up the 290 project – also suggests another similar project: BNSF has expressed interest in selling its rail line from Houston to Dallas (the one that runs out 290 to Tomball.) In 1936, that line hosted Texas’ first streamlined train, the Sam Houston Zephyr on a 5-hour schedule from Houston to Dallas. With modern equipment and few stops (the only city of note on the way is Corsicana, pop. 24,000), that could be 4 hours, maybe 3:30. That’s car-competitive (and the fact that you can work/eat/sleep on the train is a selling point there), but not airplane-competitive. This debate — slow/cheap (aka incremental) vs. fast/expensive (aka ground up) — is going on across the country. The Pacific Northwest and the Midwest have chosen for slow/cheap; California has chosen fast/expensive. The choice is not absolute — Europe has combined the two approaches on the same network, even on the same route. In some cases, where existing rail lines are nearly straight (like Houston-Hempstead), an incremental line could be upgraded to full high speed rail later. There’s no doubt that dedicated means better service, but the cost — and the impacts of new alignments — can be hard to swallow. This is perhaps the most important decision we have to make, and it comes down to political will. How much are we willing to spend? Do we have statewide leadership (which would make an ambitious project easier) or only regional leadership (which might only be enough to cobble together an incremental approach)? Do we believe in great or in good enough? In that sense, the discussion about the perfect alignment is premature. The triangle vs. the contracted triangle vs. the T, maglev vs. steel rail, is something that can be figured out in a good study. The fundamental prerequisite is the decision to move forward, the political coalition that will move it forward, and the funding source that will permit it. We have lots of ideas. But ideas are the easy part. Do you have the will to discuss this in our forums? As metropolitan regions continued to expand throughout the second half of the 20th century their boundaries began to blur, creating a new scale of geography now known as the megaregion. Interlocking economic systems, shared natural resources and ecosystems, and common transportation systems link these population centers together. Those economic links lead to travel. A megaregion needs a megaregional transportation network. We have megareigonal highways and megaregional airlines. We also need to be thinking about megaregional transit. This is by now means a novel thought. A linked megaregional transit network is taken for granted in Britain, Japan, and most of the world’s industrialized countries. The German railway actually offers a trip planner for the entire country: any bus, light rail, subway, commuter rail, or regional rail stop in the country to any other. We had this kind of network in the United States once, too. We let much of it disappear, and the rest has been divvied up by a confusing array of local, regional, statewide, and national agencies. The separation between Amtrak and commuter rail, for example, is arbitrary: commuters can ride Amtrak and intercity travelers can ride commuter rail. But federal law distinguishes between the two. The result is a fragmented network, one that can be hard to comprehend in its totality. But now that we are talking about high speed rail, our existing networks become relevant. High speed rail wants feeders. Some riders will arrive by car and depart by taxi, but there’s no doubt that good local and regional transit connections make megareigonal high speed rail more relevant. And, make no mistake, high speed rail is an interregional mode. It’s cities less than 3 hours — 600 miles or so — apart where high speed rail is most effective. Houston to Dallas makes sense. Houston to Chicago doesn’t. The closest the United States gets to megareigonal transit is in the Northeast. Amtrak’s Northeast Corridor, the fastest railroad in the Western Hemisphere, links Boston to New York to Philadelphia to Baltimore to Washington. The Amtrak station in each of those cities is also a commuter rail hub and is connected to an extensive urban rail system. This network befits a region that is still the densest in the United States and the most prosperous: 4 of the 10 largest metropilitan areas and 8 of the 10 states with the highest per capita GDP are in the the Northeast. On this map, black lines are Amtrak routes and red lines are commuter rail routes. The thickness (and the little italic numbers) indicate trains per day. Orange dots are major cities with local rail transit systems; white dots are major cities served by regional rail without local rail. Of course, not all cities are created equal, so the grey circles indicate metropolitan area size: the area of each circle is proportional to population. All these maps are to the same scale. Those dense red bundles are eight of the ten busiest commuter rail systems in the country. This is the heavy-duty infrastructure I talked about last time. Boston has two stations with 183 and 378 commuter trains a day, respectively; New York gets 529 commuter trains a day at Grand Central, 734 trains a day (and 150 Amtrak trains) at Penn Station, 286 trains a day at Hoboken, and 145 trains a day at Flatbush; Philadelphia gets 458 commuter trains a day through its downtown spine, Baltimore sees 95 trains a day at two stations, and Washington Union Station sees 115 commuter trains a day. Those systems carry 1.2 million people a day, 4 times as many as Amtrak does in the same region. But that’s nothing compared to the local transit: the New York Subway alone carries 7.6 million. The coherent spine of this system is Amtrak’s Northeast Corridor: nearly 100 long-distance trains a day on up to 4 electrified tracks. It connects the old port cities that have been the economic engines of this area since colonial times. It has literally defined this region. But you don’t have to go far inland to find a completely different world. The struggling Rust Belt towns in the inland valleys see little or no rail service. There are frequent Amtrak routes to Hartford, Harrisburg, and Albany. But beyond there, frequency falls off, often to only one daily train in each direction. Cities like Scranton and Reading have no service at all. The region that seems closest to new high speed rail service is California. Despite the state budget crisis, planning moves ahead to link San Francisco with Sacramento. California is not as populous as the Northeast, and the cities are further apart. But you have the 2nd and 6th largest metropolitan areas on each end and a string of cities in the Central Valley between Sacramento and Bakersfield — a ready-made corridor. Moreover, California’s been building a lot of local transit and laying the groundwork for high speed rail with regular speed rail: state-funded Amtrak corridors from the Bay Area to Sacramento, from the Bay Area to Bakersfield, and from San Luis Obispo through Los Angeles to San Diego are the busiest Amtrak routes outside the Northeast. Californians are getting used to thinking of train travel, and that makes high speed rail an easier sell. We have left the land of first generation commuter rail behind, with the exception of San Francisco to San Jose’s Caltrain. Commuter rail service is much less frequent than it is in the Northeast, and these systems carry a lot fewer riders, too. Up the Pacific Coast, Oregon and Washington, the 13th and 27th most populous states, seem unlikely high speed rail candidates. But much of that population is in a narrow strip along the coast, and in the 1990s the two states partnered to buy tilting Talgo trains that can make 80 mph (110 with track upgrades) on a curvy route. Portland and Vancouver have long had good local rail systems, and Seattle is getting its act together, too. The topography makes 250 mph high speed rail prohibitively expensive. But continued expansion of medium-speed rail service seems likely. Chicago is the third largest metro area in the country, with arguably the second best rail transit network. But the rest of the Midwest pales by comparison: Detroit is #12 and sinking, Minneapolis is #15, St. Louis #19. A lot of the population is spread out across the prairie, in a series of 200,000 to 600,000 metro areas. Chicago has been a railroad hub for 150 years; it’s no surprise it has a major commuter rail network and Amtrak routes in every direction. But overall, the Midwest rail network is poor. The rail lines were built across the prairie towards distant destinations, and they missed many of the smaller population centers. Illinois funds three Amtrak lines, but the third, fourth, and fifth largest metro in the state are unconnected. Indiana and Wisconsin, which don’t fund service, are even worse: the state capitol and college town of Madison, WI is an obvious candidate for a rail connection to Milwaukee and Chicago, but today you have to take a bus. The Midwest has been planning 110 mph rail for over a decade. In a flat landscape crisscrossed with active and inactive rail rights of way, that’s not technically difficult. The problem is getting seven states to agree on anything. So far, the only fruits of that work have been some basic track upgrades. For a few miles across southern Michigan, Amtrak actually goes 110 mph already. But then it has to get in line behind freight trains again. So where’s Texas? The Amtrak network is pathetic, to put it mildly. The busy routes are two trains a day (one in each direction); Houston gets 0.9 (three trains a week in each direction.) The Texarkana-San Antonio and Beaumont-El Paso routes are long-distance trains, so they come through at odd hours and are likely to be late. Fort Worth-Oklahoma City is state-funded corridor service, so it’s better, but it’s still only one round trip daily. You can take a day trip from Oklahoma City to Fort Worth, but not vice-versa. The local transit picture is getting better: Dallas and Houston have successful local rail systems. But San Antonio doesn’t have a local rail system, and Austin is about to open a stupid one. But here’s what Texas does have: the #7, #9, #29, and #39 metro areas within 300 miles of each other with a big flat plain in between. And it’s all in one state, so if that state government got behind rail, it could happen pretty easily. Ultimately, high speed rail can’t been seen in isolation. Every country that’s built high speed rail added it to a system of urban rail transit, regional commuter rail, and regular-speed intercity rail. It’s going to be easiest to make high speed rail happen where some of that network already exists. But where that network doesn’t exist, this is the time to build it. In 1985, 7 U.S. cities had commuter rail systems. Today, 14 (including Salt Lake City, above) do. Those new starts differed in significant ways — especially in level of service — from the existing systems. But now we may be seeing a third generation of commuter rail. The good news is that it offers more frequent and more reliable service. The bad news is that it costs more. The first generation systems — Boston, New York (below), Philadelphia, Baltimore-DC, Chicago, San Francisco — date from before the 1920s. Railroads never made money on commuters, but they made a lot of money as the dominant mode for freight transportation, so they could afford to spend money on passenger rail facilities. They also had an incentive to do so: the industrial executives who decided which railroad to ship their freight with were often commuter train riders, as were railroad executives’ friends and neighbors (it’s no accident that the cities with the best commuter rail systems were those with railroad headquarters.) This money bought excellent infrastructure: double, triple, and quadruple track, grade separations, flyovers at junctions, electrification, elaborate terminal stations reached through urban tunnels. That long-lived infrastructure still sustains those cities today. The second generation systems were born in a different world. In the 1970s, the U.S. railroad system seemed on the brink of collapse. Some major railroads were in bankruptcy; others were weak. Industrial decline was taking traffic away from urban rail lines, trucks were taking much of what remained, and a series of mergers made many lines redundant. Railroad executives, having seen two decades of contraction, were in a cost control mindset. When transit agencies looking to build low-cost suburban transit looked for railroad lines, the railroads were glad to rent space on their tracks or sell lines outright. Sometimes, those sales were the only thing keeping weak railroads afloat. Thus, second generation commuter rail was transit shaped by opportunity. The goal was minimal investment. This usually meant operating trains on single-track lines, using occasional sidings to pass other commuter and freight trains (as in Dallas, below). It meant simple stations (though many of the old downtown stations had survived to be reused), diesel power, and a lot of grade crossings. This was cheap. But, as usual, you got what you paid for. he old commuter rail lines in Chicago, Boston, and Philadelphia operate between 50 and 90 trains a day on over 10 lines each; New York has multiple lines with 100 trains a day. The second generation commuter lines often run only at rush hour, and only in rush hour direction. 10 to 20 trains a day are typical; some lines have only 8. But the era that created second generation commuter rail has passed, too. Freight traffic is increasing; the railroads are dealing with problems of growth, not the problems of decline. Surplus rail lines are few and far between, and active lines don’t have much spare capacity. Railroads now regret the opportunities they lost in the line sales of the 1980s and 1990s, and, since they have no problem getting money from investors, they don’t need to sell lines for cash. But the demand for commuter rail hasn’t gone away. In fact, it’s greater than ever, and more political support for transit means more federal, state, and local funding. That assure we’ll see more commuter rail. But it’s going to look different. For a hint of the future of commuter rail, go to Utah. Ignore the empty deserts: Utah is surprisingly urban. Most of the state’s population crowds in a narrow strip along the Wasatch Front. The resulting traffic congestion is nonpartisan, and thus conservative Utah has become a major transit supporter, with 69% of Salt Lake City metro area residents voting to tax themselves for transit. But it’s also at the core of the Western railroad system, with Union Pacific lines radiating out to Los Angeles, San Francisco, Portland, Omaha, and Denver, and the intermountain west’s biggest industrial cluster surrounds those rail lines. Thus, there were no spare freight rail tracks to be had. So the Utah Transit Authority bought a strip of land alongside the freight rail line from Union Pacific and built 38 miles of new passenger-only railroad from Salt Lake City to Ogden. 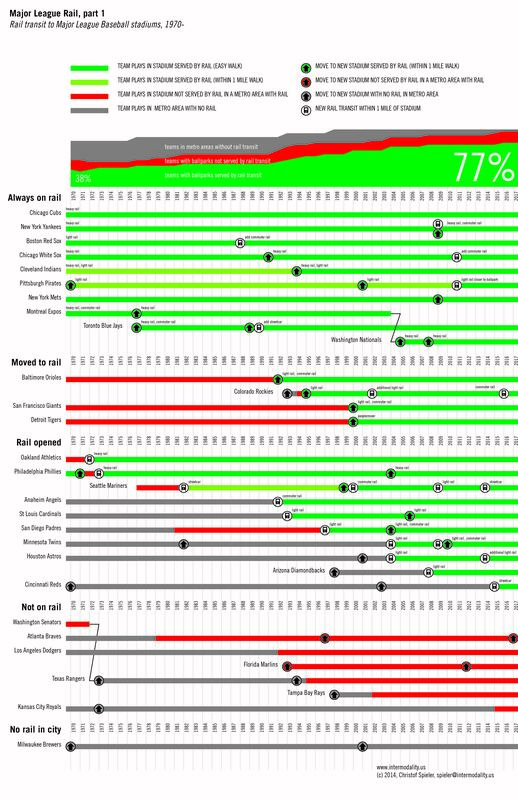 Previous commuter rail lines have upgraded signal systems or added a few sidings. But there hasn’t been a new line this long since before World War II. So what does $611 million buy, besides new tracks, 7 stations, locomotives, cars, and a 2,000 foot bridge to separate commuter rail from freight rail on the approach to Ogden? It buys a lot of service. FrontRunner every 30 minutes in each direction all day long, from 4:00 AM to midnight. That’s 74 trains a day. And, since they are the only traffic on the railroad, they’re fast (79 mph) and on time. 30 minutes isn’t quite “don’t need to look at the schedule” frequency, but it gives riders a lot of choices: what to work late? Go home early on a Friday? See a basketball game at night? Commuter from Salt Lake to Provo rather than the other way around? No problem. It also buys “futureproofing”: add more tracks and you could run every 15 minutes. But here’s a caveat: commuter rail is only a good deal if it goes where people want to go. Fast, frequent service to nowhere is useless. In older cities, commuter is integrated into the urban fabric. Downtowns grew around stations like Grand Central in New York, so passengers are dropped off within walking distance from work. 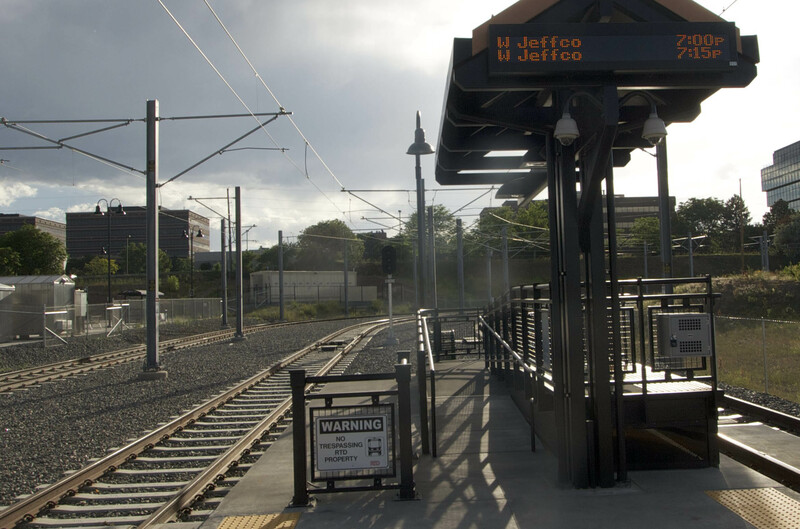 Front Runner’s station is a mile from Downtown; it’s a convenient transfer to light rail, but a transfer nonetheless. In older cities, commuter rail is also integrated into the suburban fabric: stations are in town centers, a short walk from stores and residential neighborhoods. In Salt Lake, the stations are parking lots off of the freeway. Salt Lake’s TRAX light rail line extends from the center of Downtown 5 miles south to Sandy. That line cost $300 million to build; it exceeded expectations with 20,000 average weekday riders. After a $118 million extension to the university, the system now carries 53,000. FrontRunner cost more to build but carries only 4,800. Still, Frontrunner may be the face of the future. Other cities face the same freight rail challenge. Houston commuter rail, for example, will require new tracks to get inside 610. New Mexico and Maryland have built new rail lines to go to places that didn’t have tracks before. Frontrunner is also a flashback: this is the kind of rail infrastructure we were building 100 years ago. With dedicated tracks, flyovers, and frequent service, third generation commuter rail looks a lot like first generation commuter rail.